The River Raisin Ragtime Revue (R4) is a professional theater orchestra dedicated to educating and entertaining via the performance, preservation and restoration of significant American music. R4 highlights the development of our country’s original popular musical style – ragtime. Utilizing a meticulously-researched and engaging narrative, R4 transports the audience to the cultural and social conditions of turn-of-the-century America. Special emphasis is given to the contributions of African American composers and the obstacles they overcame in attempting to gain acceptance of this unique, original art form. The River Raisin Ragtime Revue is based in Tecumseh, situated on the River Raisin in Southeast Michigan. R4 regularly performs at quality venues including The Henry Ford Museum, the Detroit Institute of Art, and Ann Arbor’s Michigan Theater and has partnered with historic Greenfield Village in Dearborn, Michigan, to present a major annual ragtime festival drawing thousands. R4 has collaborated with the Detroit Symphony Orchestra and numerous major soloists to create engaging community programming. R4 produces an annual Ragtime Extravaganza! program that brings together musicians, dancers, actors and visual artists to recreate a ragtime-era vaudeville revue. As part of its mission to bring music to underserved areas, R4 has participated in school workshop programs throughout the state and has brought high-caliber entertainment to hospitals and assisted-living communities. R4 has documented significant American musical achievements with four outstanding CD recordings. R4’s debut CD, The Red Back Book: Standard High Class Rags, was released in May 2005. This CD is the first-ever complete recording of this historic collection of fifteen classic rags published by Stark Music of St. Louis. The collection features some of ragtime’s greatest literature, including Scott Joplin’s “Maple Leaf Rag,” “The Entertainer,” and “Easy Winners.” Also included are works by James Scott, Joseph Lamb, Arthur Marshall, J. Russel Robinson and Maurice Kirwin. R4 released its second CD, Ragtime Detroit! Michigan’s Contribution to America’s Original Music, on the Stomp Off Records ragtime and traditional jazz label in 2006. Ragtime Detroit! chronicles Michigan’s significant involvement in the development of syncopated popular music and includes major hits like “Creole Belles” and “Dill Pickles,” as well as never-before recorded ragtime gems. 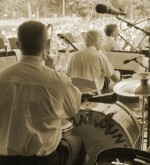 In 2011, R4 partnered with Greenfield Village to release Raggin’ at Greenfield Village, which showcases the many styles of ragtime that the orchestra has performed there. This CD includes the first published rag by an African American composer, and historically important music that had never been previously recorded. Animal Fair: Ragtime Music for Children and the Young At Heart was released in 2013 and features ragtime, blues and early jazz orchestrations of animal themed songs. Filled with upbeat and energetic music, it combines popular period tunes like “Tiger Rag” and “Kitten on the Keys” with new found works like “Lucky Dog Stop Rag” and “Rhinoceros Rag.” Animal Fair also features two new ragtime works, “Warthog Stride,” by Catherine McMichael and “Elephant Rag,” by William Hayes.